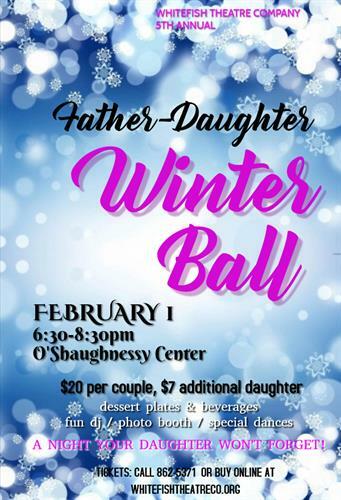 On Friday, February 1, the Whitefish Theatre Company invites you to attend the 5th annual Father-Daughter Winter Ball. This special evening takes place from 6:30 to 8:30pm at the O’Shaughnessy Center in Whitefish and is open to fathers and daughters of all ages. Although most of the night will be spent out on the dance floor with a professional DJ, guests will also be provided with a desserts and beverages and a chance to take part in a fun-filled photo booth session. Just in time for Valentine’s Day, the Father-Daughter Winter Ball promises an evening of elegance, special dances, and memories for all. This will be a night your daughter won’t forget!